Unlike many other similar TV and Internet services, Frontier FiOS Internet is built on a state-of-the-art, fiber-optic network that delivers FiOS Internet, digital TV, and digital phone to your home. Frontier FiOS packages are built with symmetrical speed tiers as fast as 1 Gig in some areas. With symmetrical upload and download speeds, you can expect a sharper HD picture, faster and more reliable Internet, and a clearer phone connection with no dropped calls. And when you bundle all three Frontier Communications services together, you will see firsthand the power, reliability, and speed that Frontier FiOS can provide in your home. FiOS TV and FiOS Internet from Frontier aren't like traditional cable services. In fact, a FiOS Bundle from Frontier is more reliable, provides better Internet speeds, clearer HD picture quality, and better phone call quality. Cable services still use copper lines – with copper lines you get a compressed data stream, which results in a degradation of overall quality. 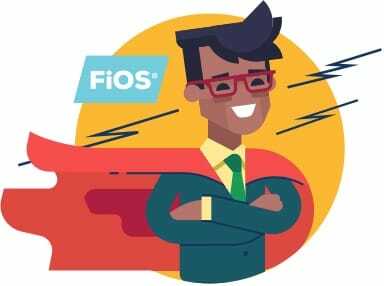 A FiOS Bundled package from Frontier uses all fiber-optics to transmit larger amounts of data at almost the speed of light, giving you some of the fastest Internet and sharpest HD TV available. Plus, when you get a FiOS Double or Triple Play you'll get a better deal on all three services. With Frontier FiOS deals, you'll only have to pay one bill instead of two or three. Want FiOS Internet in CA, TX, or FL? You're in Luck! With the recent purchase of parts of the Verizon Fios® network in California, Texas, and Florida, Frontier has expanded its fiber-optic capabilities. If you’re a Verizon Fios Internet user, you’ll still enjoy the speed and reliability you’ve come to expect. FiOS Internet from Frontier is a faster alternative to cable. Cable uses copper wires that transfer data slower than fiber-optic lines. Fiber-optics are made up of strands of glass that transmit your data at almost the speed of light, giving you a more reliable connection and a lot more bandwidth than cable Internet can provide. Plus, only with Frontier, you can enjoy symmetrical speeds. When your upload speed is as fast as your download speed, you can count on a consistent connection, no matter what you're doing online. FiOS TV from Frontier Communications provides an almost unmatched HD experience. An all fiber-optic TV network will give you an HD picture unlike any other provider's. Offering over 385+ channels, with 100+ channels in HD, and Multi-Room DVR, you'll never miss any of your favorite programs. To find out more about FiOS deals, call today.